About a week ago, David and Enid Karr of West Concord were boating on the Assabet River when they noticed a large submerged object. David posted the following description on the http://www.concordma.com/ Discussion List: "On Saturday, Enid and I were enjoying the scenery along the Assabet River when we came across a bit more scenery than we'd counted on. We spotted this item near the prison, upstream of the smokestack but downstream of Nashoba Brook. I'd never expected to see one of these in the river. I couldn't even guess what it was until we got almost to the point where I took the photo." Enid clarified what the object was by saying "It's one of these, on its side, closed, but full and bulging. Eeeeuuuwww!" 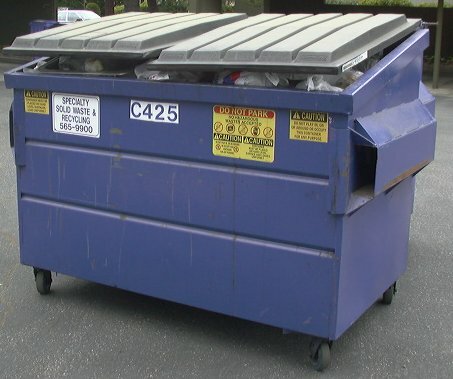 The Karrs wisely notified the Town of Concord and the dumpster company and report the authorities are working to have it removed. Any trash paddlers encountering said dumpster, in the meantime, would be wise to heed Chief Brody's advice: "You're gonna need a bigger boat!"